Fantasy owners have been waiting a long time for Tampa Bay Lightning defenseman Victor Hedman to show he should be mentioned in the same sentence as players like P.K. Subban, Erik Karlsson, and Duncan Keith. That patience was finally rewarded with a breakout performance last season and things look to be getting even better. Hedman rolled up career highs in goals (13), assists (42), points (55), plus-minus (plus-5), shots (170), power-play goals (three) and game-winning goals (two) in 75 games. Those numbers were good enough to place him fourth in the defensive scoring race. Hedman, who stands 6-foot-6, 229 pounds, picked up just five points through 12 October games. One can only wonder what his totals would have looked like had he clicked at the rate that saw him produce 50 points over his next 63 games. Rather than wonder what might have been, owners can just follow what he is doing this season. After picking up a career-high four points in a 7-1 rout of the Montreal Canadiens on Monday, Hedman found himself leading the NHL scoring race entering game action on Tuesday (he was held scoreless as the Lightning lost 2-1 to the New Jersey Devils). His seven points were good enough to rank him ahead of players like the Penguins' Sidney Crosby and the Islanders' surprising Brock Nelson. It would be folly to assume Hedman will continue to produce at a rate of 1.75 points per game over the course of a full season, but it is not out of the question to expect him to set career highs again. He has seen his points per game go up in each of his six seasons in the League. The same can be said for his shots per game. Those two statistics alone speak to the fact he has a good chance to see his totals grow, especially when you consider what he has already accomplished through four games. 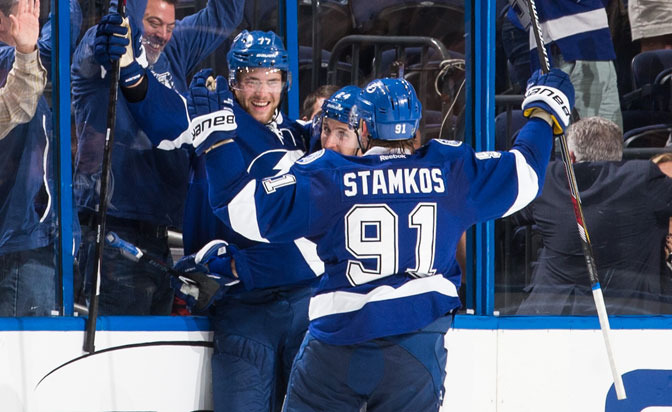 He is in a very favorable offensive situation in Tampa Bay skating with forwards like Steven Stamkos, Ondrej Palat and Ryan Callahan. He plays on the top defensive pairing with Anton Stralman, logging over 22 minutes per night, and quarterbacks the first power-play unit. He has already picked up five points with the extra man, almost half of the 14 he scored all of last season. His contributions don't end there. He also skates with the top penalty-killing unit. His work there has yielded seven shorthanded points over the course of his career, six of which, all assists, came last season. Hedman is tough to compare to other players in the League because he seems to be a perfect mix of patience, offensive awareness and defensive prowess. He makes a great first pass; he knows when to jump into the play and can be lethal from the high slot when his forwards find him with passes. All of that speaks to the fact his average draft position of 78.5 was far too low for a player that is following a special season with a spectacular one. Ryan Suter, Wild -- Sometimes when something is so consistently there when you need it, it's easy to take it for granted. That's what seems to have happened with Suter over the past two or three seasons. He managed to get out of the shadow of Shea Weber and anchor his own defensive corps in Minnesota, but fantasy owners began to look at his consistency as something that just wasn't good enough anymore. Even though he averaged more ice time than any player in the League last season (29:25), rolled up the third most points of his career (43) and set a high-water mark in shots (150), he fell in drafts this fall, finding himself selected at 92.9 overall on average. Suter has already put up three points in two games, is surrounded by a ton of offensive firepower and plays in all situations. He could be a top-five defenseman this season and will no doubt finish in the top 10. Jake Gardiner, Maple Leafs -- Gardiner is a player that could have a breakout season ahead of him, unfortunately the campaign is starting off with the same ups and downs that have plagued him over the course of his career. After picking up an assist and registering a minus-3 in his first two games, Randy Carlyle has opted to make him a healthy scratch for the past two games. He may yet have a good season, but it is going to require a wait-and-see approach. Stuart Percy, Maple Leafs -- Percy is staking a claim to a job in Toronto. He has picked up three assists, five hits, five blocked shots, two power-play points and seven shots on goal through four games. He's owned in just four percent of Yahoo leagues.